Our durable, reusable Sugar Caddies for coffee service are made of high-quality Melamine plastic. The Sugar Caddies are available in three styles for sugar sticks, sugar cubes, and sugar and sweetener packets. 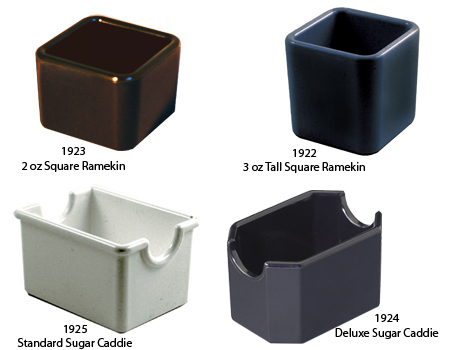 For more information on any of our Restaurant-Quality Coffee Service Sugar Caddies, please contact us at 1-800-233-0828. You might also be interested in our Specialty Dinnerware (Platters, Plates, Bowls, etc. ), Ramekins, and Mexican Food Tableware.